Share the post "A Manual Switch"
Oh what a damp and cold day it was! In spite of having the heat turned up at my office, I was still chilled to the bone. Between the wind and light drizzle, I didn’t go out unless I had to, and certainly didn’t walk anywhere including over to the courthouse. Since it was a slow day for showings, I busied myself with getting my office presentable once again, along with creating the hand-outs for the prospective buyers that’ll be attending my public open house on Sunday from 1 – 3 PM over at Prairie Place on 1st condominium complex that’s located at 320 – 1st St. NE here in Mason City. There are more than the normal pages in those brochures, but I try to make sure nearly any and all answers to questions are contained within. When considering the beastly winter we had, I’m hoping for a good turn-out of senior buyers. While I was over at Prairie Place this week on a showing, I managed to catch one of their many delightful residents home. When asking if she minded that I give the buyers a peek at her unit, she was again more than willing. What stuck in my mind, was seeing her comfortably seated in an upholstered chair in front of a north-facing window with a hardbound book in her hand. If only I had my camera with me, I would’ve asked for a photo of what I considered to be a classic shot of someone leisurely enjoying a good book in the afternoon. Since those units are so well insulated, I’m sure she had absolutely no distractions while reading, and her unit being on the 3rd floor, there wouldn’t have been any outdoor visual distractions. What a perfect place to get some serious reading done. Speaking of reading, I still can’t get my brain wrapped around the idea of someone being able to fully focus on reading something worthwhile when being distracted by visuals and noises. Whenever I see a young person reading something while plugged into an IPad, it makes me wonder how much they’re actually comprehending and remembering. Perhaps it’s the way some were raised to where they adapted to multi-tasking early on in their lives. Not long ago I did read something about how in the long-term, multi-tasking and excess peripheral distractions can create some permanent meta-physical issues. One of my clients stopped by today to drop some keys off, and we ended up talking about how people who’ve continued to do unethical things in society, more sooner than later grow immune having any sort of guilt over their deeds, along with being convinced their evil ways are invisible to the general public. I’ve seen it happen many times over the years, and it sickens me, but it does give me a bit of solace when knowing they’ll pay the price for the pain and suffering they’ve caused others–especially those who innocently believed those wolves in sheep’s clothing to be of sound character. Their slick tongues and wide smiles have been well rehearsed to where they have manipulative answers for everything. I’m sure many of you can think of a few while reading this. I had to run over to US Bank this afternoon to pick up a check for a buyer who is closing on a home purchase tomorrow. I’m not sure if you’ve ever crossed paths with Kathy Watson who is a personal banker at US Bank, but my take on her is that she’s is one of Mason City’s finest. I’ve known her for many years and all I can say is she’s top notch when it comes to customer service. What puts her above the crowd, is her willingness to do what’s best for her customers. I did mention to her today how just recently her name was brought up several times and spoken of in the kindest of ways. For sure, there are a very many personal bankers who could take lessons from her. After delivering that check, I drove out to that house and removed the lockbox off the door and then did a quick walk-thru to make sure everything was OK within. I can’t wait to see the improvements its new owner is going to be making on that home these next six months. He’s another one who’s paring down on living space in preparation for his well-deserved retirement. When you stop to think about it, there’s really no reason for one or two people to be living in a monster house when heading into their retirement years. As far as I’m concerned, it’s too much excess baggage to be responsible for on a daily basis. One of my dearest of clients is on the look-out for a roomy 2 bedroom bungalow of the 1900 – 1930 vintage which offers everything on one floor, an enclosed front porch, and lots of character. A main floor laundry would fit the bill all the more, but the garage doesn’t even have to be a double. So if you happen to know of anyone getting ready to sell a home like this in the $75K – $100K range, please have them give me a call. I’m sharing another photo from that box I purchased months ago. 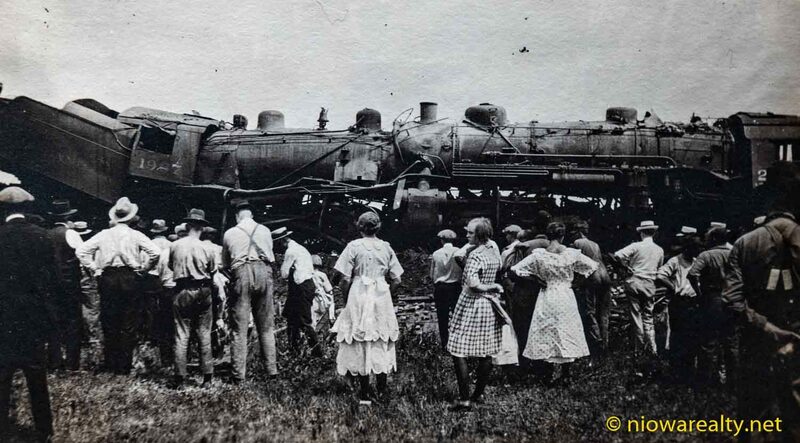 It just so happened to be a post card, but for sure it was an actual photo taken of a train wreck. Can you imagine what a sight that must’ve been at the time? Some poor devil must’ve forgotten to do a manual switch on the tracks and the engine master likely didn’t notice it in time. Just think how much everything was done by hand back a 100 years ago. Tonight’s one-liner is: Mean-spirited people are those who pick at you and try to force you into a train wreck.